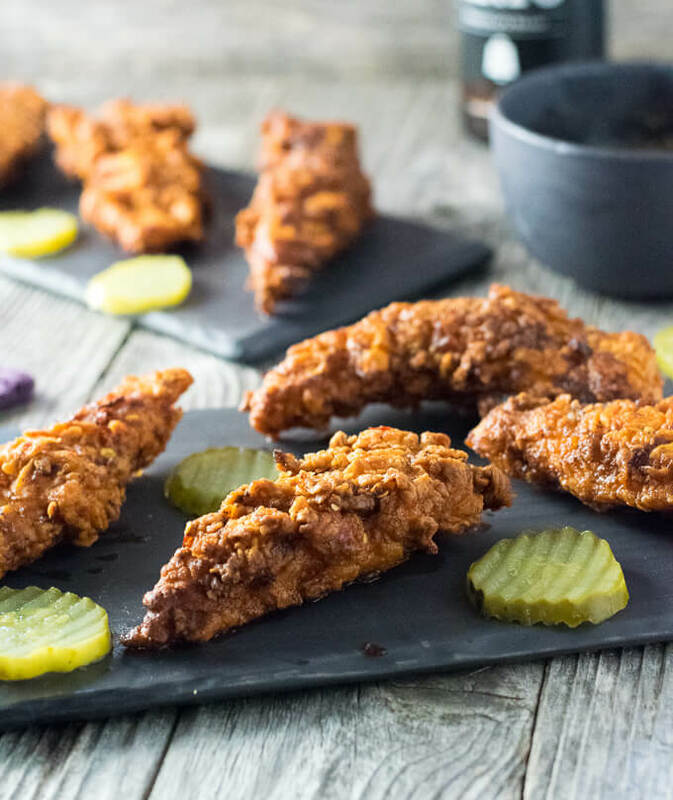 These exceptionally tender Nashville Hot Chicken Fingers are the perfect blend of sweet and spicy. They are guaranteed to set your taste buds ablaze with flavor! It is no secret I like my food spicy. However, the only hot thing my wife likes, is me. (See what I did there?!?) 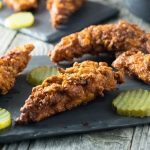 When looking at my Nashville Hot Chicken Fingers recipe, you may think it will melt your taste buds because of all of the cayenne pepper called for, however, the brown sugar really balances it out. So much so, this is actually my wife’s favorite fried chicken too! 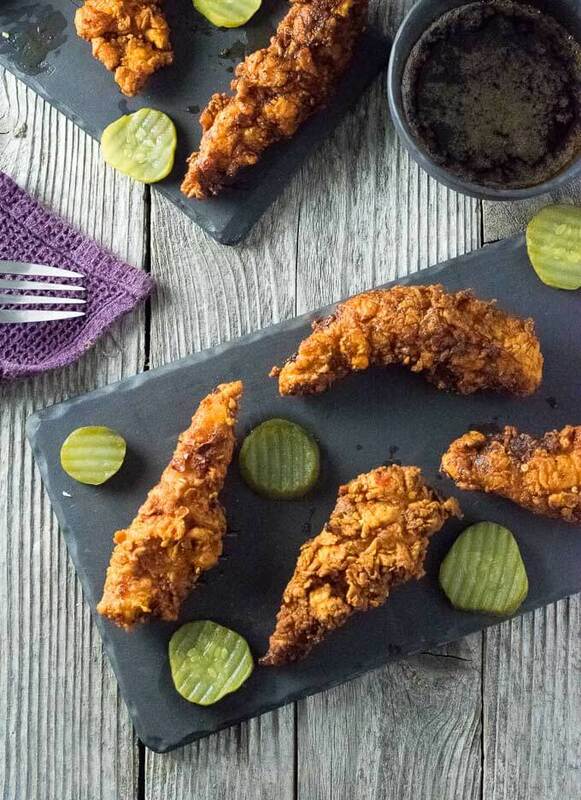 If you are even mildly tolerant of spicy food, whip up a batch of this Nashville Hot Chicken. You will love it! However, if you are the type that finds ketchup too aggressively seasoned, perhaps a nice big plate of saltines may be more suited for your tastes. First things first, frying these hot chicken tenders taste best. Quite honestly it is next to impossible to make these in the oven because the frying oil is so important to the final flavor. Spoiler alert: The frying oil is mixed with seasonings and brushed over the fried chicken before serving. It gives it a flavor that is out of this world! You don’t need a deep fryer to make these in your own kitchen. I use a simple cast iron chicken fryer, just like your grandma used, with exceptional results. The thickness of cast iron maintains an even heat better, and the deep sides help keeps messes contained. However, you can certainly use other skillets as well if needed. The above links are affiliate links. 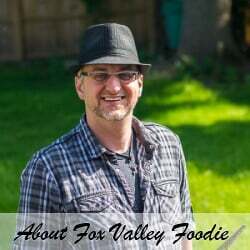 Any Amazon purchases made through these links helps support FoxValleyFoodie.com at no additional cost to you. Obviously, you are going to need some sort of thermometer to monitor frying temperature. However, the great thing about frying chicken is, the chicken is done with the breading is browned, if you are cooking in the right temperature range. 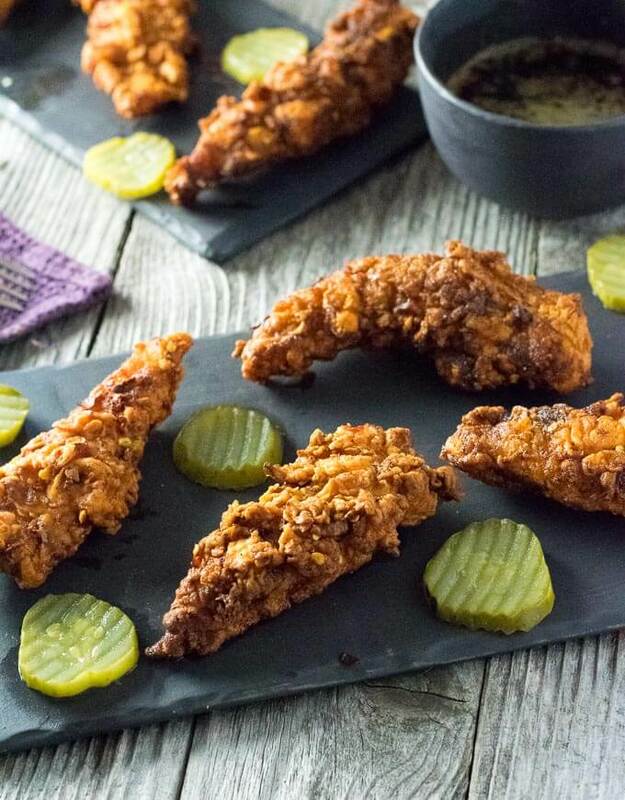 For these Nashville Hot Chicken Fingers, any temperature between 350-375 will produce great results. If you have leftovers, you can reheat these in the oven at 350 degrees. Check them after 10 minutes. They are ready when they feel hot! Place chicken in a large bowl and season with salt and pepper, toss to ensure even coverage. Add oil to your deep sided cast iron pan and fill with 2" of oil. Heat on medium high until the temperature reads 350-375 degrees. Place chicken in frying oil, working in batches as needed, and fry till golden brown and temperature reaches 165 degrees, turning chicken as needed to ensure even frying. ~5 minutes. Place cooked chicken on a separate wire rack until all chicken has been fried. Let oil cool slightly and brush oil mixture over each piece of chicken and serve on top of white bread with pickles. This recipe was inspired by my all-time favorite Nashville Hot Chicken recipe. If you prefer your fried chicken on the bone, you will want to check it out! If you enjoyed reading my Nashville Hot Chicken Fingers recipe then you should probably like me on Facebook and follow me on Pinterest too. That’s what I would do at least, because if you don’t get to know me but you still use my recipe it is kind of like taking candy from a stranger, and your mom taught you not to do that. Don’t disobey your mom, subscribe to Fox Valley Foodie today. Yes, yes, 100x yes. These look SO good, and I know my whole family will love them too. Can’t wait to try them! There is no better way to make chicken!!! !